A core component in the PSMJ services offering is its comprehensive approach to marketing and selling of design services. Besides offering dedicated business development programs, success-based skills are embedded in other PSMJ programs, such as Project Management and Leadership events. Winning Proposals and Presentations, a 2-day intensive program, is available in Australia / New Zealand on an in-house basis. For more information, contact Charles Nelson or Elina Bowron on +61.3.9686.3846. For the best current thinking on marketing for design, subscribe to the PSMJ monthly newsletter A|E Marketing Journal. In North America, PSMJ offers a special program, either as a public or in-house program: Get Work Now. For details and event dates, click here. 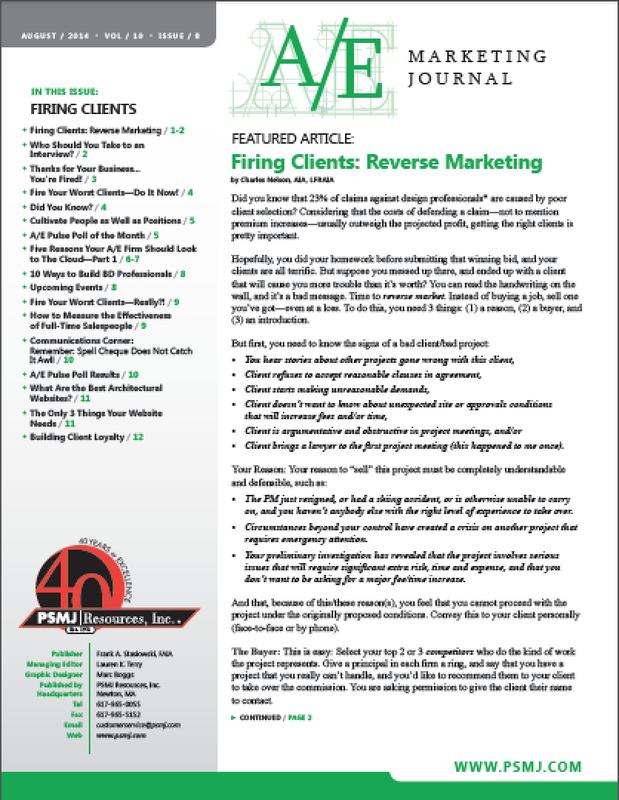 If you’d like a complimentary copy of the above issue of A|E Marketing Journal, with my lead article Firing Clients: Reverse Marketing, email me and I’ll send it out to you.